With 80 years of experience in water treatment and purification, the specialty chemicals company LANXESS with its Liquid Purification Technologies business unit (LPT) has a solid basis to appear at this year’s IFAT. The world’s leading trade fair for water, sewage, waste, and raw materials management takes place in Munich on May 14-18, 2018. 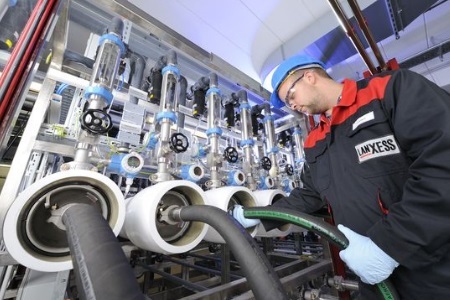 LPT is the only supplier in Europe to produce a wide range of ion exchange resins and adsorbents as well as membrane elements for reverse osmosis. The combination of the two methods paves the way for highly efficient solutions. “Many years of experience with numerous reference projects together with our high-quality products from the Lewatit, Lewabrane, and Bayoxide ranges are the foundation for our success. Our customers worldwide benefit from this in various types of applications,” says Jean-Marc Vesselle, head of the LPT business unit. The reliable supply of drinking water to the world’s population is not the only challenge that constantly calls for new, innovative types of solutions. Water management in industry and agriculture also involves considerable challenges. Intelligent technologies and tailored products can help in the development of sustainable solutions. “Efficient processing and recycling methods will be essential in order to meet the demand for water in the future,” Vesselle states. LPT offers various services in this regard. Dr. Jens Lipnizki, head of Technical Marketing Membrane at LPT, will discuss the example of efficient wastewater treatment resulting in the almost complete avoidance of wastewater at an Indian textile dyeing factory (minimal liquid discharge, MLD) as part of a presentation at a joint event by the German Water Partnership (GWP) and the Federal Ministry for Environment, Nature Conservation and Nuclear Safety (BMU) on May 15, 2018. His presentation as part of the India country special (IFAT forum B2), “Successful water management in India – challenges and opportunities”, illustrates how practical, sustainable solutions can be developed based on expertise and experience. A particular strength of ion exchange resins is their ability to selectively remove heavy metal cations or complex anions during the water purification process. Accordingly, LPT will present Lewatit TP106 at IFAT, which binds oxyanions such as perchlorate, chlorate, bromate, and nitrate with high selectivity. It thus complements a series of special ion exchange resins, including Lewatit TP 107 and Lewatit TP 207. The former, a strong basic, macroporous resin based on an interlaced polyacrylate, enables the efficient removal of various types of polyatomic oxyanions. Notable is the high capacity for chromate, as well as vanadate and molybdate, during the treatment of drinking water. Similar to Lewatit TP 106, it is certified according to NSF/ANSI standard 61. Also worth mentioning is another new product which will be presented at IFAT – the gel-like, strong basic Lewatit S 5128. This acrylate-divinylbenzene-copolymer enables highly effective adsorption and desorption of naturally occurring organic substances and is approved for use in food applications. Membrane elements from the Lewabrane RO ULP (Reverse Osmosis – Ultra-Low Pressure) series are the new high-end standard with regards to energy efficiency. They are designed for a test pressure of just 7.6 bar. Compared with standard elements, a 40 percent reduction in operating pressure is therefore sufficient. Energy and operating costs are reduced accordingly. “A membrane with high water permeability and high flow rates, like the one we offer with Lewabrane RO ULP, also helps to sustainably reduce investment costs for water purification,” highlights Alexander Scheffler, responsible for marketing in the LPT business unit. LPT offers a comprehensive range of tailored ion exchange resins and RO membrane elements for various types of applications. For more information, visit http://lpt.lanxess.com.